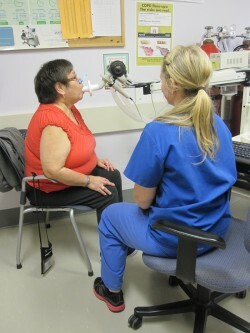 Beverly Nelson (L), taking a lung test under the supervision of Respiratory Therapist Tassia Dunne (R) at St. Paul's Hospital in Vancouver, BC. When Beverly Nelson experiences a lung exacerbation, her first thoughts are usually of her grandchildren and great-grandchildren. “I always find myself praying hard that I will make it through this attack so that I can see them again,” says Beverly who was diagnosed with Chronic Obstructive Pulmonary Disorder (COPD) thirteen years ago. Lung exacerbations, or ‘lung attacks’ are experienced by about a third of those who suffer from COPD – a progressive disease that causes reduced lung function in the form of shortness of breath and coughing. When a lung attack takes place, the symptoms of COPD worsen resulting in increased breathlessness, coughing, and wheezing . Lung exacerbations not only take a physical and emotional toll on those with COPD, but are also an enormous burden to the healthcare system. Such exacerbations are the leading cause of emergency room visits and hospitalizations among chronic disease sufferers in BC, and across the country. Consequently, lung attacks incur up to over $5.7 billion in direct and $6.7 billion in indirect healthcare costs every year in Canada. To address the devastating and costly impacts of COPD exacerbations, the PROOF Centre of Excellence, Genome BC, Siemens Healthcare Diagnostics, and Providence Health Care are providing much needed funding for the Centre of Excellence for the Prevention of Organ Failure (PROOF Centre) to develop a simple blood test that can determine if a person is at risk for a lung attack. This test could be available to any physician in BC and would be a huge step forward from the current diagnosis method: a breathing test that is available only in certain centres in the province and which must be performed by specially trained staff. This predictive test will also provide a more accurate picture of a patient’s condition, and will allow physicians to better treat and manage COPD. The PROOF Centre team working with Dr. Sin and investigators from GlaxoSmithKline have identified unique gene and protein marker sets (called bio-signatures) that have the ability to predict which patients will likely have frequent lung attacks. The development of a predictive test for COPD lung attacks highly complements the initiatives undertaken by the BC Ministry of Health to overcome COPD. Already, a plan is in place to mobilize COPD experts at three Lower Mainland hospitals who will identify lung attack patients seen at each site. The goal of the program includes providing proper self-management education to these at-risk patients and to establish follow-up care procedures either with their family physician or the COPD clinic. Such a program opens the door for a seamless transition from laboratory-based discovery to effective patient management targeting the prevention of fatal lung attacks.